President Trump announced that he will terminate the provisional residency permits of about 200,000 Salvadorans who have lived in the country since at least 2001. They will face deportation. Good. The administration will give these refugees until Sept. 9, 2019 to leave the US or to get a green card. DHS released a statement today covering all of this. The excuse the left has used to keep these people in the US is that they suffered through an earthquake in 2001. 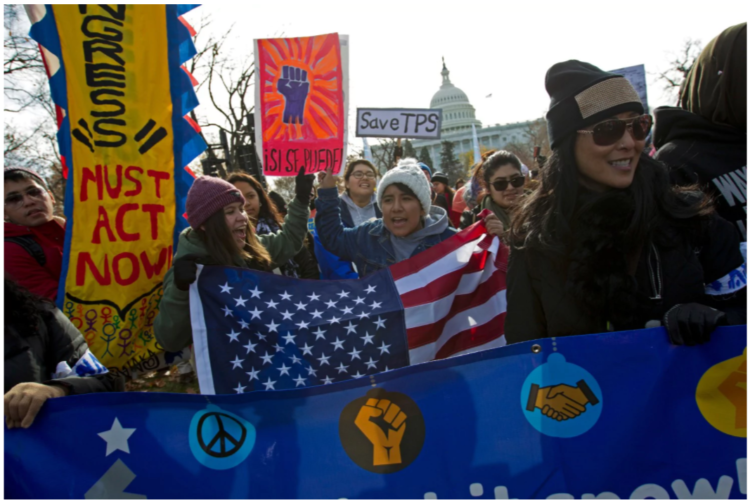 After they came here, they were granted Temporary Protected Status, or TPS, and their permits have been renewed on an 18-month basis ever since then. But that was never meant to be permanent. There was nothing stopping these people from seeking legal citizenship here if they really wanted to stay. The left is calling this a reduction of legal immigration. This is not immigration. These people were refugees from a catastrophic event in their home country. The US let them come here to get back on their feet. It was up to them to either become legal citizens or return home. So, spare us the virtue signaling already. If you read the Washington Post, and I highly recommend against it, you would hear how they are claiming these people are being persecuted by big, bad meanie Trump. They especially whine about the nearly 700,000 who were protected under the Deferred Action for Childhood Arrivals program that will lose their legal status beginning in March. Homeland Security officials characterized Monday’s TPS decision by Secretary Kirstjen Nielsen in narrower legal terms: as a recognition that conditions in El Salvador have improved enough since the earthquake to no longer warrant the TPS designation. That’s exactly right. I take extreme umbrage to the illegal immigration issue. My son-in-law came here the right way from Denmark and he became a citizen last year. We are very proud of him. That’s not what is going on here. The left wants all of these people to stay and NOT get citizenship. It’s to provide cheap labor and change the voting demographic without all the red tape. It’s an insult to everyone who has come here legally. “Based on careful consideration of available information, including recommendations received as part of an inter-agency consultation process, the Secretary determined that the original conditions caused by the 2001 earthquake no longer exist,” the DHS statement read. We have deported more than 39,000 Salvadorans in the last two years. DHS says “that the temporary inability of El Salvador to adequately return their nationals after the earthquake has been addressed.” It would seem so. The left started begging Nielsen to extend the TPS designation for these people. They cited the country’s horrific gang violence and the potentially destabilizing effect of so many people being sent home. Yes and the Salvadorans brought that violence with them here to the US in the form of MS13. The most brutal gang on the planet. I know the country is violent, but it is their home. If they feared going back, there was nothing stopping them from working towards becoming a legal citizen. Don’t be fooled, there are Republicans pleading on this too. This TPS practice must end, just as chain migration, lottery visas and illegal immigration as a whole must end. I get they own homes and work here, but this is not their country. Come here the right way or go home. And build the damn wall.